Most historians agree that Washington and Jefferson’s ownership of slaves has tainted the positive legacy they left. And some monuments and memorials to both men attempt to address that part of their lives. 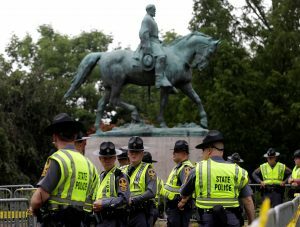 For some, monuments to those founding fathers “force us to contemplate the centrality of slavery to the making of the nation,” said Gregory Downs, a history professor at the University of California, Davis who studies the impact of the Civil War on the United States. But he also said the difference between the nation’s first president, George Washington, and then man who sought to secede from the nation, Robert E. Lee, isn’t complicated. “It is obvious that traitors in arms to the nation are not equivalent to those who created it,” he said. Adding to the complexity of the debate, many Lee memorials were erected long after the Civil War as part of an effort to rehabilitate Lee’s reputation and denigrate his victorious opponent Ulysses S. Grant, who fought to preserve the nation and later defended black civil rights as president. He said that historical consensus is very different now than when Trump learned it in school decades ago. People like Lee were presented as heroes and people like Frederick Douglass, about whom the president seemed to have little knowledge earlier this year, weren’t presented at all. Andrew Dalton reported from Los Angeles.